There were two things about this book made me really excited to read it. One, it's written by Kendare Blake, whom I've heard some great things about and two, the premise read like such a dark and suspenseful tale - perfect for me. I'd have to say now, I honestly don't know how I finished it. Three Dark Crowns really tested me. My biggest issues were the writing, the characters - both their arcs and relationship development - and the plot progression. I found that the writing didn’t suit the context of the novel. The story had some very adult content, but the writing came across really juvenile. I don’t know whether it might be me outgrowing Young Adult, or the fact that it read a lot younger, but it didn’t feel right - especially when I was reading those explicit scenes. It just didn’t read as a great novel, and this also created a problem with the characters' development. Pretty much all of them came across as flat, with no progression or an interesting arc. I struggled to connect with any of them, and have absolutely no attachments. Their relationships with each other also weren’t developed in a relatable way. Blake tells us of how close characters are with each other, or how their relationships are suppose to be, but doesn’t show any of it. We’re suppose to believe that’s how it is, but I couldn’t see it at all. Fair warning there’s insta-love, which I think needs to go in YA books, but also a really strange way of introducing toxic relationships but not really exploring it properly. Instead, I felt like rather than frowning on infidelity, it made it seem okay, which frustrated me the most when reading. I do think that Blake built a somewhat solid world, with powers that were intriguing to learn about. The pacing picked up close to the end, which help pushed me through the rest of the story. I really did want to know what would happen at the end - the concept is still one that I think is most unique, compared to other YA reads. I really wish that Blake had focused on that more: the politics between the three sisters, the history behind the battles, and how this set up affect the people. Instead, there was too much romance that I felt added no depth to the already lacking plot. 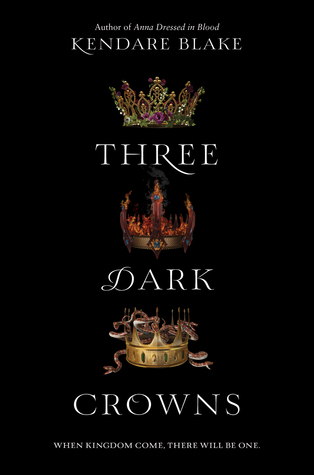 Three Dark Crowns was an average read to me, with no outstanding characters and okay writing. 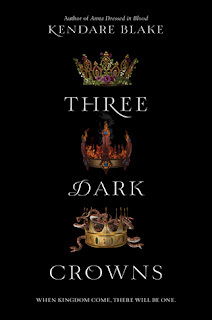 In saying that though, the ending did give me hope that maybe the sequel will be more of what I expected of this series, so I will be checking out the second book.